The Sister Parks Arrangement for Resources and Knowledge Sharing (SPARK) is pleased to invite AMCHAM members and their families to the opening ceremony for a commemorative trail honoring 200 years of U.S. - Thai Friendship. 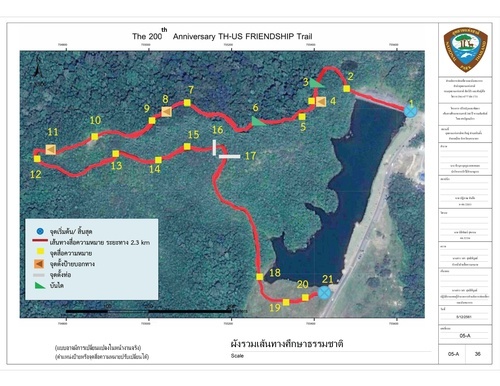 This 2.3 kilometer trail near the Sai Sorn Reservoir is the pilot trail in SPARK's 10-year project to develop Khao Yai National Park into a world class park by upgrading park resources and strengthening park managment via knowledge sharing and connecting to international park professional networks. SPARK is a joint effort between AMATA Foundation, the Thai Department of National Parks, Wildlife and Plants Conservation (DNP) and the International Conservation Caucus Foundation (ICCF). AMATA, as project coordinator, has spearheaded this project in an excellent example of public-private partnerships in promoting sustainability and nature conservation. Please join for a family-friendly day of nature and hiking, and the chance to learn more about this exciting project and different volunteer opportunities going forward. 14.30: Cocktail reception with a presentation on the SPARK Project and volunteer opportunities.